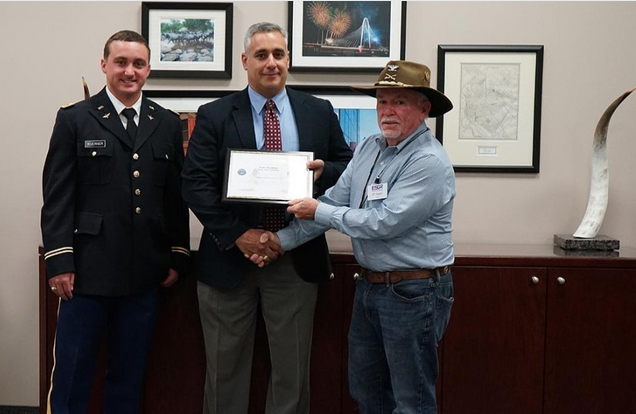 Lone Star Analysis and it Director of Prescriptive Analytics Tom Abraham received the Above and Beyond Award and the Service Member Patriot Award, respectively, from the Employer Support of the Guard and Reserve (ESGR). Lone Star Analysis, a Dallas-based specialist in leading-edge predictive and prescriptive analytics solutions, and its Director of Prescriptive Analytics Tom Abraham received the Above and Beyond Award and the Service Member Patriot Award, respectively, from the Employer Support of the Guard and Reserve (ESGR). Lone Star has a long history of working with government and military agencies, and understands the need to be committed to those who serve. That commitment showed true with Lone Star Analyst Lt. Weston Woerner, the nominator. Abraham and Lone Star received their respective awards due to their efforts supporting Woerner as he prepares to become an Apache Longbow pilot. The Patriot Award, given to Abraham, recognizes individual supervisors for support provided directly to service members or their families. This often translates to supervisors being flexible with and supportive of reserve members through various means including flexible scheduling, time around deployment, allowing leave of absences and helping assist the service member’s family. The Above and Beyond Award, given to Lone Star, is an award that is eligible to companies who have had supervisors receive the Patriot Award. It is given in limited quantities to employers who have exceeded the legal requirements of the Uniformed Services Employment and Reemployment Rights Act by providing their National Guard and Army Reserve employees with extra benefits such as recuperation of pay to offset lost wages, expanded health benefits and other additional support beyond the scope of the act. ESGR, a Department of Defense program that distributes these awards, was established in 1972 to promote cooperation and understanding between Reserve Component Service members and their civilian employers, and to assist in the resolution of conflicts arising from an employee’s military commitment. ESGR helps foster a culture in which all employers support and value the employment and military service of members of the National Guard and Reserve in the United States.